With the Ednet.smart home Starter Kit you are able to secure your home. Receive notifications about the status of your sensors - no matter where you are. The Ednet.smart home contact sensor you, if a door or window is opened or closed. The motion sensor alerts you when detected movements within your home. You will be informed immediately via push notification on your phone, once the contact sensor detects a change of state. So you always know when someone enters your home. 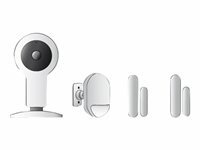 In conjunction with the integrated camera of the starter kit, you are able to see live who enters your home. This gives you a maximum security feeling. With the Ednet.smart home Starter Kit a connection to your network and all other devices will be established.